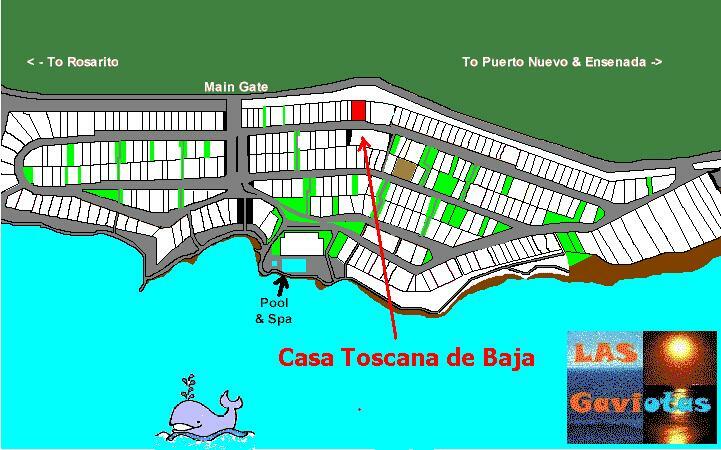 Come enjoy a taste of the Italian wine country in Baja!! TREASURE THE TIME SPENT WITH FRIENDS OR FAMILY! 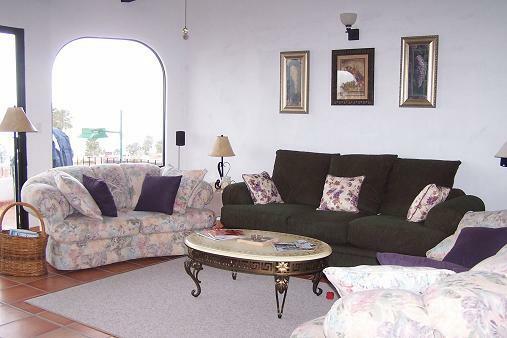 TALK, PLAY GAMES, WATCH TV, OR JUST RELAX WITH A COOL BEVERAGE IN OUR BEAUTIFUL LIVING AREA. TAKE PLEASURE IN THE TERRACE WITH ITS BREATHTAKING WHITEWATER VIEWS. WHAT DO YOU FEEL LIKE DOING TONIGHT? READING A GOOD BOOK, WATCHING A MOVIE, PLAYING A FUN GAME, OR MAYBE JUST COZYING UP NEXT TO A FIRE AFTER A FULL DAY OF BAJA ACTIVITY! CASA TOSCANA HAS IT ALL! JUST LOOK AT THE OTHER END OF THE LIVING ROOM! TV, VCR, DVD, CD PLAYER, ALL CONNECTED TO AN AWESOME SURROUND SOUND SYSTEM! WHY EAT OUT? 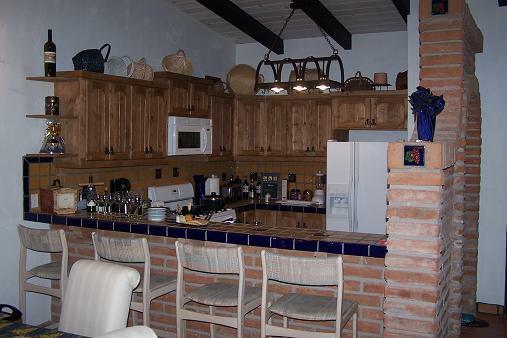 OUR KITCHEN HAS EVERYTHING EVEN EMERIL OR JULIA MIGHT NEED TO PREPARE A MEAL FIT FOR YOU! FULLY EQUIPPED, OUR KITCHEN IS THE IDEAL PLACE TO TEST YOUR CULINARY SKILLS. BEST OF ALL, YOUR GUESTS CAN SIT AND OFFER ADVICE, OR JUST KEEP YOU COMPANY AS YOU PREPARE TO SERVE YOUR BEST! (OH YEAH, FOR THE GUYS, IT’S EASY TO GIVE YOUR BUDDIES A BEER FROM THE FRIG WITHOUT LEAVING THE KITCHEN!) I ALMOST FORGOT TO MENTION, THERE’S A HALF BATH JUST OFF THE KITCHEN AREA TO KEEP THE EXERCISE TO A MINIMUM! DINING AREA, BAR, OR LIVING ROOM (WITH THE PROVIDED TRAY TABLES), THERE’S PLENTY OF ROOM FOR EVERYONE TO TAKE DELIGHT IN THE GOODIES FROM THE KITCHEN. 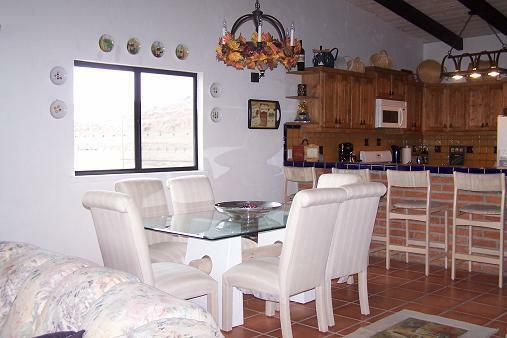 Casa Toscana has 4 bedrooms, each with own unique “theme”, and all have private bathrooms! 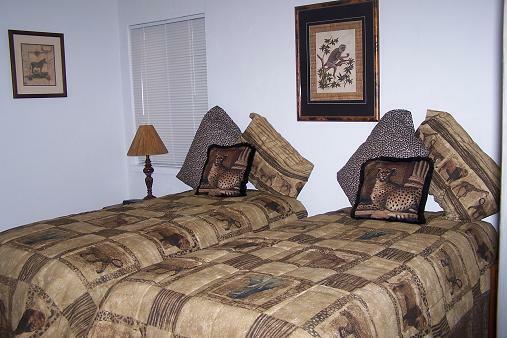 Rent 6 nights & get a 7th night free! A one-time cleaning fee of $60.00 is required. CHECK BACK PERIODICALLY FOR SEASONAL SPECIALS!! In case of cancellation, your deposit is refundable subject to filling your reserved dates. Please contact us for more information. 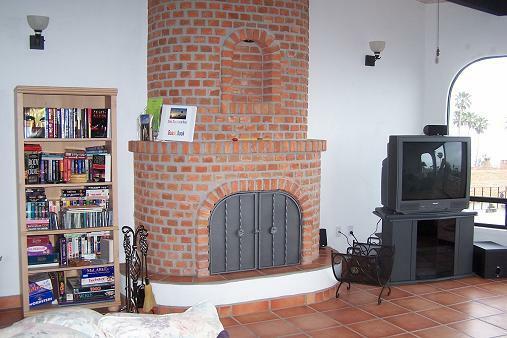 Want to rent this house? Just fill out our short form. If you like, you can email the homeowners. 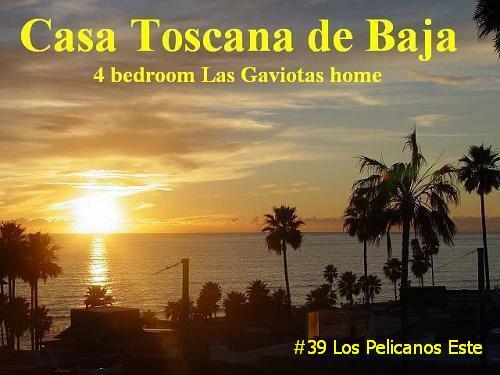 The bedrooms at #39 Los Pelicanos Este. 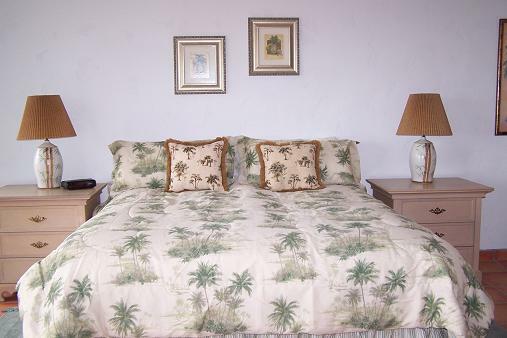 Like the tropics? The master bedroom is a charming tribute to all things warm, airy, and loaded with romance. The private bath is complete with a double vanity, large shower (with tub), and plenty of ambience! Not enough, check out the next photo. 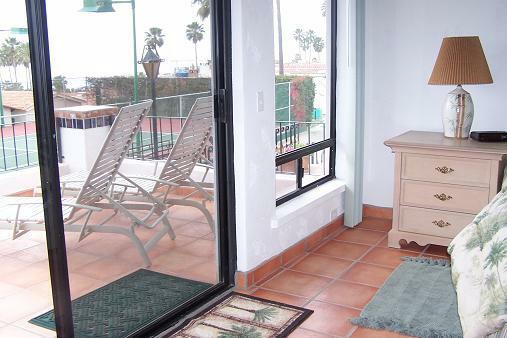 We thought you might like to see a view of the Master bedroom terrace! We are right across from the tennis court! More master pics! We really love this room, and we know you will too! 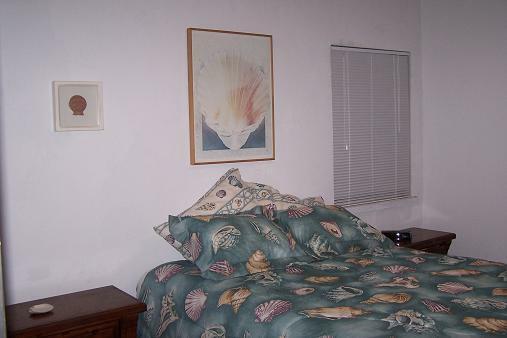 This is the other side of the master bedroom! This room has space for days! The Tuscan Room. Continues the house theme. 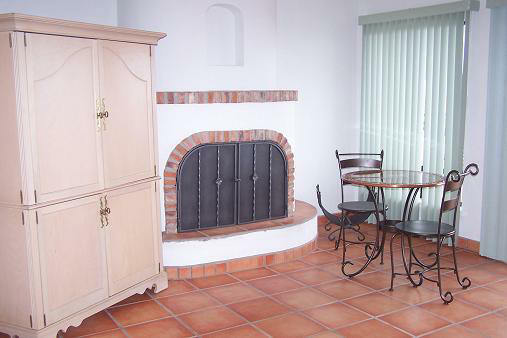 this “second Master” is nestled behind the kitchen and living areas. King size bed, private bath, and loads of comfort, this bedroom provides luxury, privacy, and an aura of the region from which it gets its name! The Marine Room with its nautical motif is a whimsical nod to the stunning Pacific Ocean, just steps away from the home’s front door. The comfortable queen size bed offers the guest a chance to rest and rejuvenate for the next day’s activities!